New Cornish eco-hotel The Scarlet has been crowned Cornwall’s Business of the Year, after winning the coveted overall “Winner of Winners” trophy at last night’s Cornwall Business Awards. In front of a record audience of well over 300 business and public leaders at St Mellion International Resort, the Mawgan Porth-sited luxury hotel overcame competition from 11 other category winners to claim the evening’s top prize. 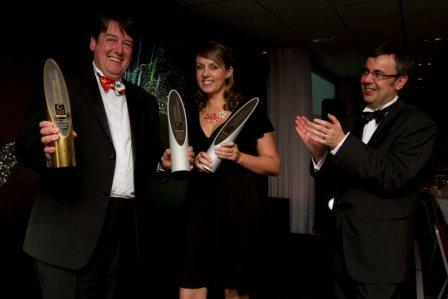 The overall title made it a hat-trick of awards for The Scarlet, adding to awards for Best Website and Best New Business in Cornwall earlier in the evening. The night’s other multiple winner was Padstow-based book manufacturer TJ International, extending its impressive track record in both the Best Use of Technology and Business Improvement through People awards. Mike Quest of Roche-based Quest Environmental Solutions (QES) was named Cornwall’s Business Leader of the Year, while the award for Best Young Business Person went to Thomas Hazzeldine, better known to Truro shoppers as Baker Tom.